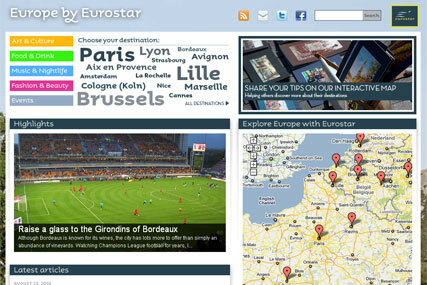 Eurostar has launched a crowdsourced travel guide as part of its wider 'Exploring is beautiful' campaign to inspire customers to travel beyond its core destinations of Paris, Lille and Brussels. The guide, designed by social media agency We Are Social, allows travellers to submit their own reviews of destinations around Europe to the site. It is be supported by a blog highlighting the best things to see and do in featured destinations. In July, Eurostar launched the "Exploring is beautiful" push, which involved its first TV campaign in three years and a re-launch of its "Little break, big difference" consumer website under the name "Europe by Eurostar". The cross-channel rail operator reported an extra 50,000 passengers following the disruption to air travel caused by the ash cloud earlier this year.